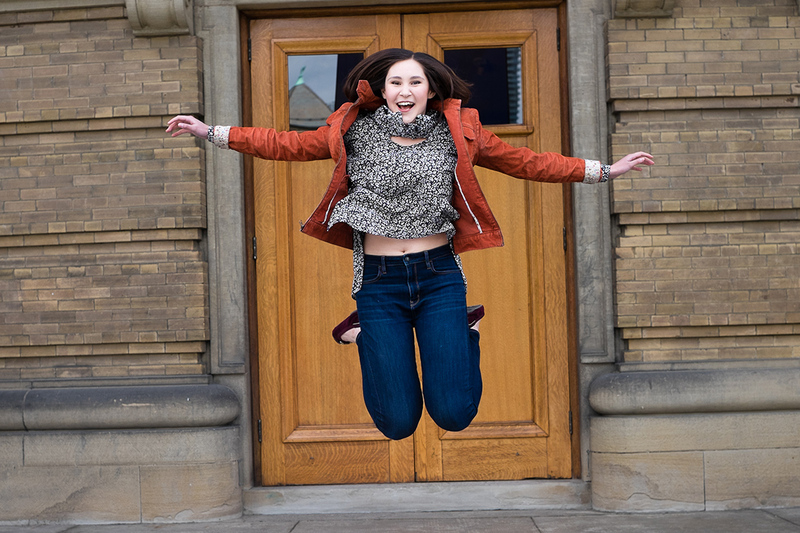 When Allie Sinclair came to the University of Toronto as a 17-year-old, she was nervous. She arrived from Albuquerque, N.M., and didn't know anybody. What's more, she had heard “horror stories” about tough courses and professors who bell curve marks down to keep averages within a range. In fact, her lowest mark throughout her undergraduate studies in experimental psychology would be an 89 – just one per cent short of an A+. Sinclair graduates this June with a smooth 4.0 GPA and the highest grades of thousands of graduating undergraduate students across the university's three campuses. She receives the John Black Aird Scholarship as U of T's top student, the Rose Sheinin Award, given to the top female student graduating from a science program, and one of three Governor General's Silver Medals bestowed on the most academically outstanding graduating students. Based on her near-perfect marks, you might think she spent most of her time in the library. But she found time for hobbies and didn’t follow a strict study schedule. She was an actor in the Victoria College Drama Society, playing the lead role in a production of Peter Pan. She was a soprano in the Hart House Singers. And she enjoyed going for hikes and exploring her new city and the Toronto Islands. As early as orientation week, she became involved in lab research. Her first RA position was in the Social Perception and Cognition Lab of Associate Professor Nicholas Rule. Later, she discovered her great passion, memory research, working in another lab under Associate Professor Morgan Barense. At age 20, Sinclair is already the first author of an article that was provisionally accepted for publication in the journal, Learning & Memory. She credits her work on memory for giving her an edge in university. “I've definitely picked up some tricks and tips along the way,” she says. She learned about the testing effect, the finding that practice tests help long-term memory. So if she was trying to memorize a brain pathway, for example, she would do her readings, then try to sketch out the information on a blank piece of paper. She also put her lessons into words by teaching her friends – or even talking to herself if necessary. “I'll teach the wall if there's really no one around,” she says. She did most of her studying before bed, knowing that memories are consolidated during sleep. “When you form a new memory, you need hours for the neural networks that represent it to undergo this process of protein synthesis,” she explains, ”and a lot of that happens during sleep.” By studying at night, she avoided “interfering information” that might interrupt process. It was never her intent to be U of T's top student, she says. Although she was a high achiever in high school, she prepared herself for the occasional lower grade in university – what she saw as the tradeoff for coming to a demanding school. Sinclair, a Singapore-born, dual Canadian and U.S. citizen, says she was drawn to U of T because of Toronto's multicultural character. And she was also impressed with VicOne, a program of seminar-style, small classes in different streams for first-year students. She was in the life sciences stream. Her next challenge will be to pursue a PhD in cognitive neuroscience at Duke University, where she plans to continue her research on memory. She hopes it will lead to a job as a university professor – a career that would satisfy her passion for performance, through lectures, and for asking the big questions.